The next part of the project turned out to be getting everything lined up. After rebuilding the guitar I left it at pitch for a week or two to see if anything moved… it didn’t. Since the last post I have also moved the bridge over a bit to improved the line up of the strings. Unfortunately with the bridge in the right place the bass string started popping out if anyone breathed too loudly so I took the bridge out to cut a much deeper saddle slot for the bass strings. Even with these changes it still lacked quite a bit in the playability department. After several hours trying to shave the bridge I concluded that the neck joint really did need the neck to lay back a bit more. The Egmond’s neck joint it rather different from the Fender-style neck joint you might see on electric guitars. 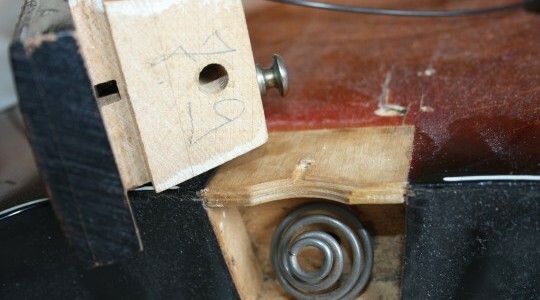 Instead of the four big screws it relies on a single bolt to counter the tension of the strings. 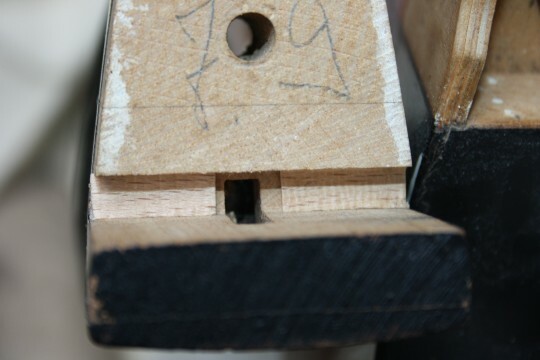 Basically the neck pivots on the plywood at the top of the neck joint, whilst the single bolt goes through the heel of the neck, through the spring and into the body. 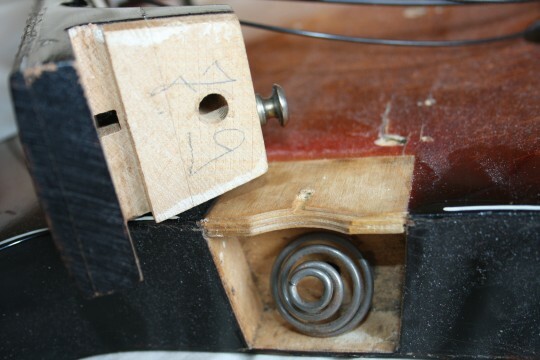 Adding some shims to the pivot point allows the neck angle to be increases slightly, dropping the strings down a bit and making the guitar more playable. The shims were made by setting a plane to a fairly brutal setting and running it up and down a piece of beech. Sadly they were not quite thick enough, even when doubled up. The folks over at The Guitar Grounds were very helpful. After they described how the 70s era Fender’s were generally shimmed using whatever was at hand (often business cards). I figured if business cards were good enough to US made Fenders then I could get away with four layers of wooden shims. Actually I have three shims on one side and four on the other so correct the angle slightly. It’s done the job. The neck is now laid back enough that the little metal wheels on the bridge can adjust the action properly. I’ve been forced to set the action a little higher than I would like because the frets could really do with the attention of a crowning file (which I don’t have). Nevertheless it makes the world of different to its playability.